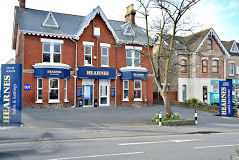 We have been exclusively instructed by Hearnes Estate Agents to recruit a Head of Office for their highly impressive and successful Poole office on Parkstone Road. Hearnes also have high profile offices in Bournemouth, Ringwood, Ferndown and Wimborne and regards themselves as ‘an independent estate agency with local values, a national presence and a pro-active approach”. This exciting opportunity will suit an experienced estate agency manager looking to progress his or her career with this highly-regarded company in a senior role. Managing a large team, you will be responsible for managing and developing the business, growing the revenue and profitability, and on-going recruitment where required. The successful candidate will need to adopt an employer mentality rather than an employee one, and needs to be someone who will treat the role as if it is his/her own business. You will be expected to lead by example, and must be extremely professional in your approach, possessing impeccable customer service skills. You should also be able to demonstrate a proven track record, a strong work ethic, excellent negotiation skills, clear verbal & written communication skills, good IT skills and a full UK driving licence. This position will offer an initial guaranteed salary in the region of £60,000.